During this period, there will be a daily [Countdown Quest] that you can challenge. ▼ Pre-Event RT Campaign [Part 1] begins! Have a chance to get ★5 Collaboration Employees [Red Blood Cell (Fighter)], [Macrophage (Warrior)], and [Platelet (Cleric)]! 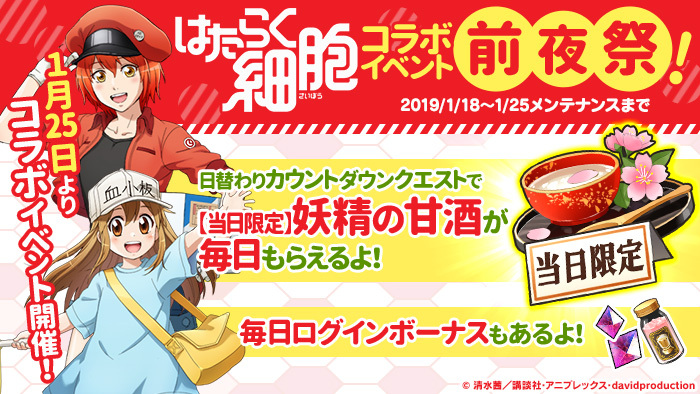 This lottery gives a chance for 5 people to win the [Limited] Red Blood Cell Envelope, [Limited] Macrophage Envelope, and [Limited] Platelet Envelope which guarantee a collaboration employee resume inside. ※ To receive the reward, please link your twitter account to your game account with the [Twitter Link] feature in-game before the lottery ends. ※ The tweet for each character that needs to be retweeted will be different. Please check each tweet during the schedule to participate. ▼ Pre-Event RT Campaign [Part 2] begins! Starting on 1/21 (Mon), retweet a specific tweet from the official Kanpani☆Girls twitter account to receive in-game items. Depending on the total number of retweets, all users will receive wonderful rewards! Collab with Hataraku Saibou? Kinda unexpected but I'm ok with it... time to save shinestones!